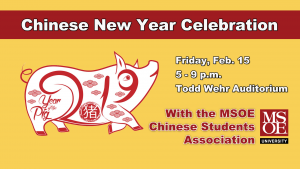 Join the Chinese Student Association in a celebration of the Chinese New Year. 2019 is the Year of the Pig! There will be a raffle, talent show, authentic Chinese food, soft drinks and a gift for every guest.